There are a variety of selections for Thanksgiving dinnerware. Whether you prefer autumn dinnerware or turkey dinnerware, I'm sure you will find something that will make a long-lasting impression for this holiday. Fall dinnerware offers several options for the season for everyday use as casual dinnerware sets and by adding a few accessories, like a turkey platter or Thanksgiving salt and pepper shakes, it can transformed into an awesome Thanksgiving setting. Fine china is also available and turkey designs are plentiful. I am amazed by the choices of Thanksgiving dinnerware patterns that are introduced every year. There are some classics that are timeless, like the Plymouth pattern by Pfaltzgraff and the Woodland Turkey by Spode. Along with the classics are trendy dinnerware patterns that are short-lived, but beautiful all the same. For autumn dinnerware, I really like the Pfaltzgraff Plymouth casual dinnerware sets. It has a harvest-like embossment in autumn colors featuring leaves, berries, acorns, pumpkins, and corn. The rims of the platters and plates are scalloped with accent lines. It is available in the traditional design along with square dinnerware pieces. It's casual, but classy, and perfect for Thanksgiving dinnerware. 222 Fifth has produced a pattern called Autumn Celebration. It is adorned with autumn foliage and Thanksgiving quotes. I have seen full sets available with accompanying accessories such as a two-tier stand, a gravy boat, cream and sugar bowls and salt and pepper shakers. From a less known manufacturer, comes the Autumn Inspirations pattern. It was popular in 2014, but I haven't found it advertised anywhere this year. 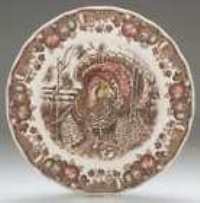 The border of the plates features autumn-colored leaves and the center of the dinnerware is adorned with the word "blessings". Matching plates feature a bird that is perched on a branch. You can even find the Thanksgiving theme in disposable dinnerware. This is great if you are more into spending time with family rather than putting your all into cleaning up after a traditional holiday dinner. There are several turkey dinnerware patterns that are perfect for serving Thanksgiving dinner. The Woodland Turkey pattern by Spode is amazing. 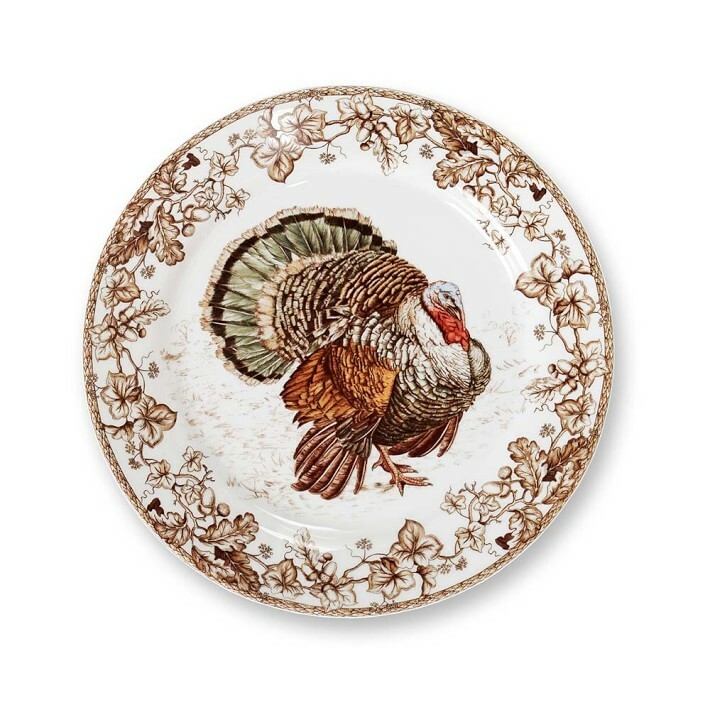 It's an English dinnerware pattern that features a majestic turkey bordered by Spode's 1828 British flowers. The appearance is country-style. I like the brown border and the gentle mixture of colors of the turkey. It's not too bright which makes it easier to coordinate with accessories for a fabulous looking table setting. 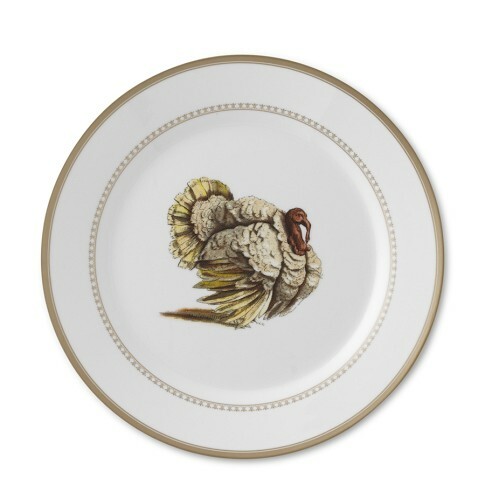 I also like the Spode Celebration Thanksgiving Turkey pattern. The border design matches the Woodland pattern, but the entire pattern is brown and white. It is less colorful than the Woodland Turkey pattern, but very elegant. Churchill China made a beautiful Thanksgiving Turkey pattern. 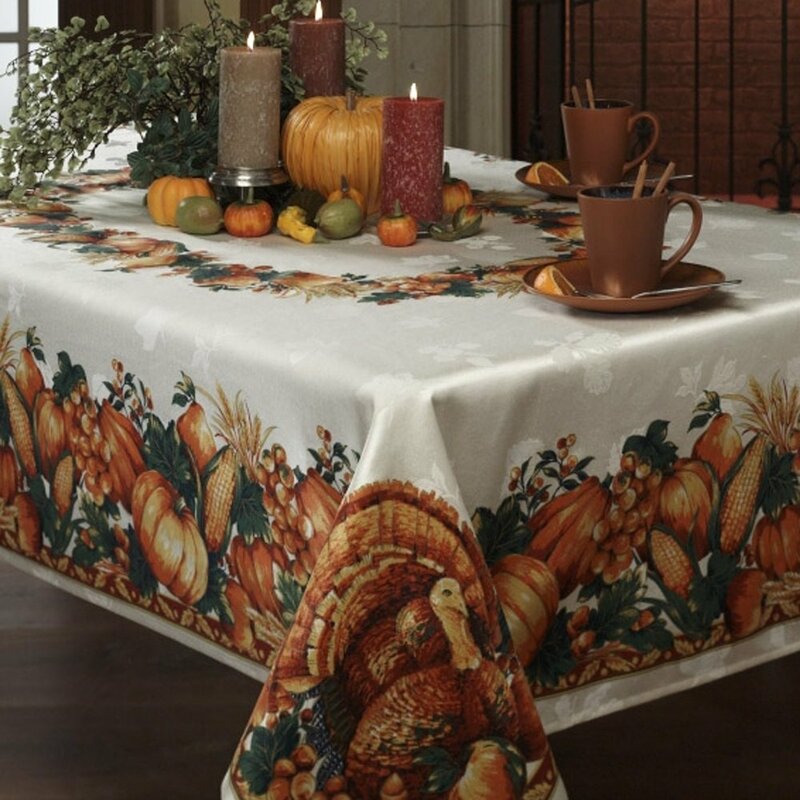 The pattern consists of foliage that surrounds a stunningly colored turkey with a floral border. This pattern is commonly called Queen's Myott. The Churchill turkey pattern has also been available in blue and white. The Johnson Brothers His Majesty Thanksgiving Turkey pattern has a colorful turkey pattern that you might enjoy. At one time I thought the pattern had been discontinued, but it seems to be widely available this year, which is a good thing. The pattern features hand engraving and a fabulous looking turkey with a multi-colored fruit border. Previously Williams-Sonoma distributed a porcelain dinnerware pattern with a golden mica rim that featured a turkey in the center. The pattern was called Estate Turkey. There was a matching turkey platter and coordinating accessories. In 2015, the featured pattern from Williams-Sonoma is called Plymouth Turkey. It matches perfectly with the turkey theme tureens, glass serving dishes and salt and pepper shakers that they make available for a stunning Thanksgiving table.